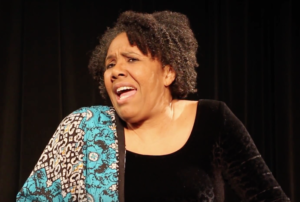 In recognition of March as Women’s History Month, the Wilton Library and the Wilton Historical Society will be presenting “A Journey . . .” a one-woman show by Westport writer and actress Kimberly Wilson. The performance will take place on Sunday, March 3 at 3:00 in the Brubeck Room at the Wilton Library. Rooted in research, “A Journey” is a tour-de-force of acting and song, as the statuesque Wilson modulates her powerful contralto from a whisper to a fervent spiritual, capturing the spirits of Harriet Tubman, Sojourner Truth, Rosa Parks, Maya Angelou, two invented characters she calls the Slave Woman and African Queen, and a new historical figure, Haggar Tonquin of Wilton. She tells their stories with strength, dignity, and pride. While these historical reflections are the stories of black women with remarkable experiences, they could be about any woman striving to make a better life for herself, her family and her community, and are an appropriate way to mark Women’s History Month. Ms. Wilson skillfully tells of the struggles and influence of Black womanhood as an integral part of the history of the United States. Most significantly, for this event in Wilton, Ms. Wilson has worked with the Wilton Historical Society to write a new character for her presentation. Research has revealed that a black slave named Haggar, born 1770, and owned by Wilton’s Samuel Belden II, was married to a Native American slave named Bill Tonquin. Tonquin was owned by another branch of the Belden family in Wilton. Haggar and Bill Tonquin had three children, Prince, Nancy and Black Jack, and lived in the Belden Store at the corner of Ridgefield Road and “Danbury Pike” a crossways that is at the heart of Wilton’s town center. Haggar Tonquin is documented as being the last slave in Wilton. Her children were slaves, but were born with the promise of freedom, as they would have been freed at age 21 by the Connecticut law passed in 1783. From these facts, Ms. Wilson has developed a new character based on Haggar Tonquin. Her story will incorporate information about how people of the 18th century worked and lived – and especially the repetitive daily tasks of enslaved women. To bring more authenticity to the character of Haggar Tonquin, Ms. Wilson has worked with the Society’s museum educator to learn how to churn butter, card wool, break flax, and other such work. “Family slavery” was practiced in the North, with slaves living with the family they served; women performed domestic chores and men worked on the farm or business of the master. In addition, Ms. Wilson will be adding material to Harriet Tubman’s part. Wilton had a stop on the Underground Railroad, at the home of the abolitionist William Wakeman at 8 Seeley Road, and this will be included in her dialogue. At the end of the presentation, Ms. Wilson will conduct a “talk-back” session, and there will be a reception following the session. 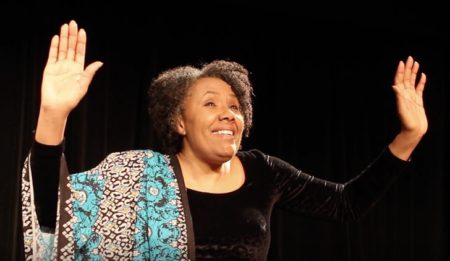 Ms. Wilson was awarded “Best Playwright” in 2016 by the Atlanta Black Theatre Festival for the piece. Suggested for ages 10 and up. To register for this event, click here.